News broke yesterday that both Jake Guentzel and Teddy Blueger put ink to paper. He is currently registered as being 5'11, which is the same height as a certain Sidney Crosby. Is he of Sidney Crosby's caliber? Well, no. But his height at the very least shouldn't be too much of a hindrance for his NHL success. 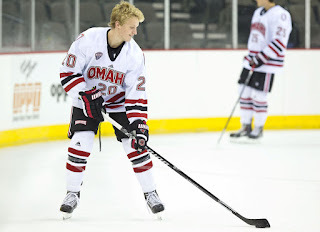 Jake Guentzel recently completed his junior season at the University of Nebraska-Omaha, where he scored 19 goals, and led the team in assists (27) and points (46), making this is the second straight year he's lead the team in scoring. 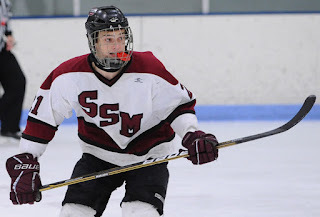 He set career highs this year in points, goals, power play goals (5) and shorthanded goals (3). This is an indication that Guentzel can play with apparent ease in all situations, something that Pittsburgh HC Mike Sullivan and WBS Head Coach Clark Donatelli will likely adore in his game. When NHL ready, Guentzel could be the second coming of Jordan Staal, behind Sidney Crosby and Evgeni Malkin. Blueger will be heading to the Wilkes-Barre/Scranton Penguins, along with Jake Guentzel. This is a very interesting situation, as after the Charlottetown Islanders finish their season, the WBS Penguins will also be receiving top Penguins prospect Daniel Sprong. A meeting of the Penguins prospects hockey minds will be taking place soon!